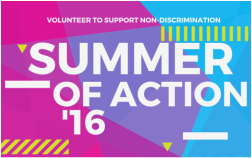 It's A Summer of Action for Equality! Are You In? Don't see a date below that works for you? ​We will be having one-on-one conversations with people around the country to listen and talk about why gay and transgender non-discrimination protections are important. We will help voters think critically about our opposition’s arguments and help them build empathy for gay and transgender people. And we will learn from these conversations what works best with voters so that NEXT TIME we can WIN! One-on-one conversations are one of the most powerful ways we can educate the public about LGBTQ non-discrimination -- especially about transgender protections. We also know we have a lot to learn to make these conversations even more effective. Our Summer of Action will help us accomplish both! PHONE BANK: There's only one way we'll win equality and justice — by having real conversations with local people about our issues. That's why we need you as part of our growing volunteer team on the phones! VOLUNTEER RECRUITMENT: We need your help to call and recruit folks who signed up or expressed an interest in volunteering. This outreach is critical to fill our volunteer shifts!